Search and rescue team members take cover from the rain in Paradise last November. 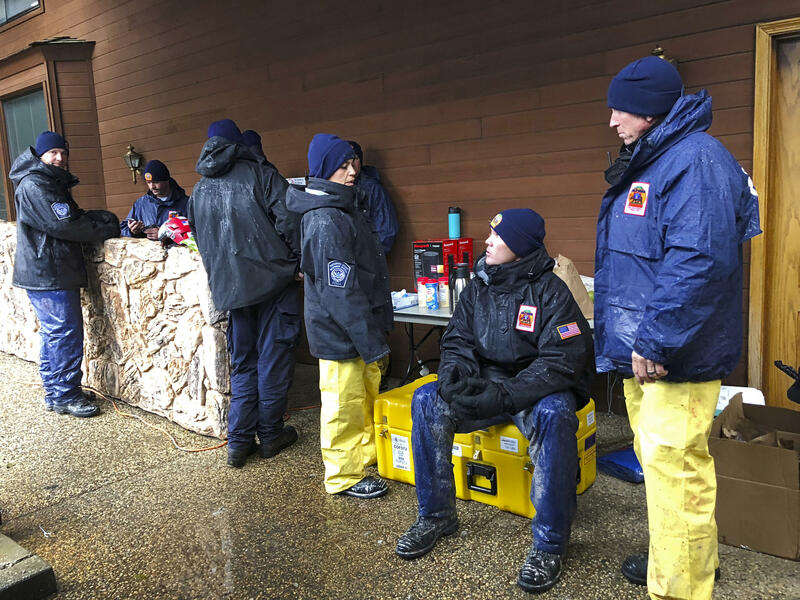 The team from Orange County was aiding in Camp Fire recovery efforts. Fire victims whipsawed by the sudden prohibition against living on one’s own home site before debris removal, saw a silver lining. Officially, 190 families had moved back to the burn area or planned to when federal officials, citing health concerns, pressured local officials to prohibit living near debris. Unofficially, the figure is considerably higher. After an outcry, county, state and federal officials are greasing the skids, at least for those that bought or applied for electrical permits. Their properties will be cleaned first. Once debris is removed, residents can return. Officials said a temporary trailer park with three dozen spots had just opened in Oroville, set to accommodate those ejected by the health ruling. A second, with 15 slots would open soon at the CMA Church in Paradise. More will be developed if there’s demand. Efforts to relax zoning codes for temporary housing more generally, were viewed with some concern, especially in rural areas. “I can hear it right now, somebody’s neighbor brings in X-amount, whatever we decide, and it’s impacting them, we’re going to be getting those calls, I want to urge caution.” explained Butte County Supervisor Bill Connelly. In the end, most were rejected, though FEMA received permission to use agricultural grazing land for temporary housing. FEMA representative Dan Horvath said the agency will place 620 manufactured homes at five different sites in Butte County. Additional sites are in neighboring counties. The homes won’t be ready before April due to negotiations with property owners, regulatory compliance and installation of utilities. The county also received good financial news. Reliant as it is on property taxes and with so much property destroyed, revenue is expected to slide steeply. Paul Yoder, the county’s lobbyist in Sacramento said a rescue by Sacramento is pending, with a proposal moving forward that would replace lost property tax revenue for four years. “The senate voted on it just yesterday, and it’s heading to the Governor’s desk, we may actually get a Governor’s signature by the end of the week.” Yoder said. The board also approved more overtime for the Sheriff’s office. After reported confrontations between locals and repair crews, Pacific Gas & Electric Company requested additional patrols. The county expects PG&E to pay back the full amount.